We could have made this article a simple instruction document on how to write an essay outline, but this article goes a step further. Not only will you get detailed technical information on things such as how to create an informative essay outline, and a 5 paragraph essay outline, and an argumentative essay outline, and so forth, this article also gives you tips and tricks of the trade. It offers advice on how to get your outline done correctly, how to get it done more efficiently, and how to write your essay outline so that it makes your writing job easier and helps you score higher marks. We have writers on hand at our paper writing service to write your essays for you, to write your dissertations, your term papers, your research papers, and any assignment handed to you by a mainstream college, High School or University. Not only will we create a fully customized and original piece of work, but we will also proofread and edit your efforts too, and we do it all with degree-qualified writers and for a fair price. You start your argumentative essay outline with a hook. You are not selling second-hand cars, so it doesn’t need to be a flashy or attractive hook, it simply needs to let people know what your essay is about and needs to attract the sort of people you are targeting, (which is typically your professor or teacher). Then, you may add a little background to your introduction and add in your thesis where you make the point you wish to prove. The body of your essay should contain a claim, evidence for your claim, an opposing view, evidence for the opposing view, and then either backing down, a refutation, or agreeing to disagree. You may undertake this process as many times as you need. After you have exhausted your persuasive argument, you may conclude your essay. Should You Use Essay Outline Template Guides for An Informative Essay Plan/Outline? We at PaperWritingPro.com do not use templates because they encourage lazy writing, but our writers have years of experience putting together outlines, which means our writers do not need templates. Since you have less experience writing an informative essay, you may get a lot of use out of an essay outline template. At the very least, it may help you get started. Be wary of where you get your outline template because many websites host sub-par templates with the hopes that you will give up and use their essay writing services instead. Plus, some templates try to offer guides on how many lines each section should have, which is not good for you. Your outline should show a space for your introduction, your thesis statement, your body, the fragments of your essay body (such as point 1, point 2, etc. ), and then your conclusion and bibliography. Do not be afraid to “Plan” to write too much for each section. The great thing about writing too much for each essay section is that you may go back later and cut it all down to make it more concise. Cutting it down is always better than having to go back and bulk up the word count. Your persuasive essay outline needs to introduce itself and then give a thesis statement. In many cases, your thesis statement is going to point out exactly what you wish to convince the reader of. However, in many cases, the issue is so complex that you need to give a brief summary of what you are going to persuade the reader about rather than being fully accurate and concise. For example, some topics demand that you teach the reader a few things about the issue in hand before you start persuading them on it, and that may require a slightly more complex thesis statement or a summary thesis statement. A persuasive essay works by making a point and then giving reasoning or evidence for the point you just made. You must then find opposing views and proof for them. Then, you then need to refute the opposing views, agree with them, or agree to differ with them. You then go through the same process again until you have added enough to convince your reader of your point. During your conclusion, you must bring all the points you have made together, and then pair them up or relate them to your thesis statement. You need to do all of that within your essay, which means those elements need to appear in your persuasive essay plan/outline. Make a plan to write a regular essay. Plan to write far more than a 5-paragraph essay would ever need or want. Do this because it allows you to go back and trim down your essay. Trim it down and make it concise so that you may fit it all into five paragraphs. This may sound nuts, but if you do this, you will have a very high scoring essay because you have condensed a larger range of points into a smaller package. As you can imagine, your outline is fairly simple. You have an introduction, three paragraphs in the body, and then a conclusion. The essay cannot be complex in any way, which means it is very easy to write an outline for it. If you are given the option, you should probably avoid the 5-paragraph outline structure because it is very limiting; especially if you have a word count allowance of thousands of words. If your hand is forced, then you may find that the 5-paragraph structure suits a narrative essay outline and an expository essay outline. This is because it makes planning these essays easier because they are the types of the essay where it is easy to write a lot and then snip it down without doing damage to your ability to gain higher marks for your outline and for your work as a whole. Writing a compare and contrast essay outline is very difficult because there are several ways you may organize your compare and contrast essay. There is a block approach, a point-by-point approach, and a hybrid approach. If you are writing and shorter essay, then the block approach will work the best because it requires that the user retains a fair amount of detail from each block section. The block approach starts with an introduction, and then compares and contrasts all the elements of Plan A, and then compares and contrasts all the elements of Plan B. Plan A is discussed in a block, then plan B is discussed in a block. However, plan B refers back to Plan A quite excessively in order to highlight differences and similarities. Finally, the conclusion doesn’t add new information, and it doesn’t make new points. The most common method is the “Point-by-Point Approach” where there is an introduction with a thesis, and the body is made up of points and examples. The first point will discuss both subjects, compare and contrast them, and then give examples. Similar is done for point two, three, and so forth. A conclusion is then added without repeating any claims and without adding any new information. The importance of the similarities and differences are highlighted and related to the thesis. 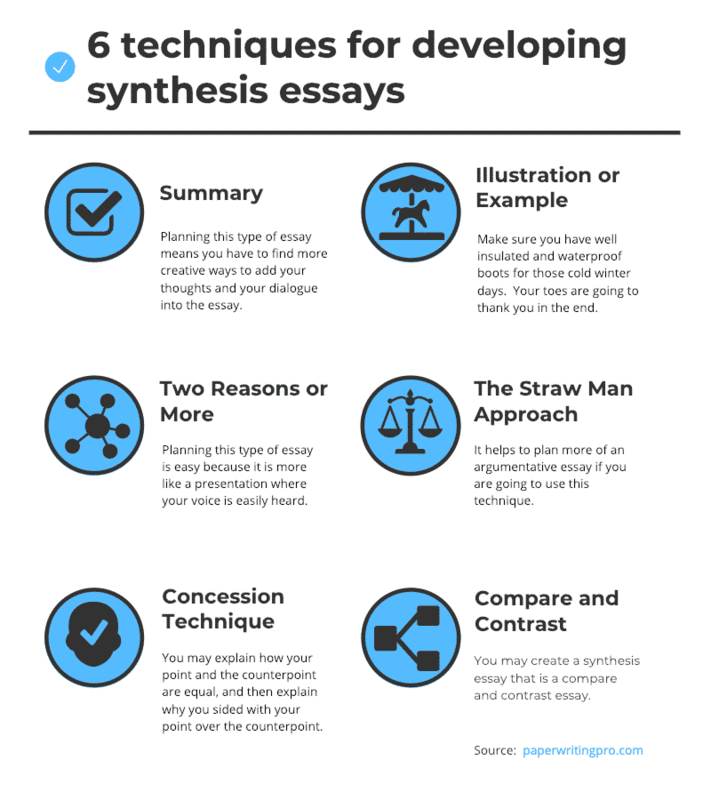 If you want to know how to write an essay outline for a synthesis essay, then pick one of the many techniques used for developing synthesis essays. Your sources are summarized and then concluded upon. Planning this type of essay means you have to find more creative ways to add your thoughts and your dialogue into the essay. Here you work towards using sources and giving examples and illustrations to make your points. Your plan must consider the sources, and then consider how you plan to create a dialog using illustrations and examples. State your thesis and then state two or more reasons why your thesis is true. Planning this type of essay is easy because it is more like a presentation where your voice is easily heard. Plan the same sort of essay you would with the “Two Reasons or More” method listed above, but you offer counter-arguments, and then you go ahead and defend against said counter-arguments. It helps to plan more of an argumentative essay if you are going to use this technique. Try to show how the counter-arguments are weak, flawed, irrelevant, or that they are more of a stalemate than a counter-argument. This technique is the same as the straw man method, but instead of showing that the counter-arguments are weak, flawed, irrelevant or a stalemate, you accept that the counter-arguments are of equal value to your points. You may explain how your point and the counterpoint are equal, and then explain why you sided with your point over the counterpoint. You may create a synthesis essay that is a compare and contrast essay. If that is the case, you should write your essay outline as if you were writing a compare and contrast essay. Does Practice Make Perfect When It Comes to Informative Essay Outlines? Students who keep trying to improve their essay outlines are always going to prosper over the students who go with the flow. With that mentioned, there are two things you can do to help your progress. The first is to take your professors notes/corrections/amendment-requests on your essay outlines and write them down on a document that you keep on your PC/laptop desktop. Whenever you are proofreading your next outline or your next essay, you go over your professor’s notes to see if you have made the same mistakes. Collecting and keeping your professor’s notes will help you create a large document full of things you have done wrong in the past. Checking for those errors whenever you proofread your essay, or your outline will help you avoid making those errors again. Also, teachers and professors find it very frustrating when they have to keep correcting students for the same things. The second way to help your outline write progress is to embrace the outline as a guide for writing the essay. Many students write the outline/plan because they have to. They write it, and then they forget about it as they write their essay. You shouldn’t forget about your outline, you should use it as your working plan. You should create your own for personal use where you can litter it with notes, with references from sources you wish to try, and where you may even add a schedule so that you can check up on your progress and see how well you are doing when writing your essay. Finally, if you want help quickly because you have a deadline fast approaching, then get in touch with us and let us write your outline or your essay for you. Set your deadline, pick a price, and we will do all the hard work for you.